Oh Ralphie. She's gorgeous, a phenomenal photographer, and has birthed three of the most darling little daughters I have ever seen. Plus her name really is Ralphie, which I've always thought was so awesome. You kind of just can't help but love her. Asking Ralphie to guest post was a no brainer. You'll see why. Dressing my little chickens has been quite the occupation of mine for some 8 years. I have made it something of a mission of mine! And I am happy to share what I have learned, though it comes with a bit of a disclaimer. My house is full of little humans of the female variety and I have had modest, if possibly no experience with dressing boys. However, I am certain that with a little imagination these rules could apply to both! 2. Think outside the tag. 3. Dress babies like babies. 1. Buy it compatible. This means to buy things that are interchangeable, pieces that can easily create new outfits. Of course we do this for ourselves, but why is it that as soon as we start to dress our little ones we throw on the matchy matchy sets? Try to avoid sets where the top goes with bottom. Use your creativity and the outfit will pop! This is easier to do once you find a color pallet that you love for your children. Also, shopping at consignment stores where they have lots of brands and sizes helps. 2. Think outside the tag. Don't be deterred by size or gender specific clothing. I know this sounds weird but life has been so enjoyable since I adopted this rule. 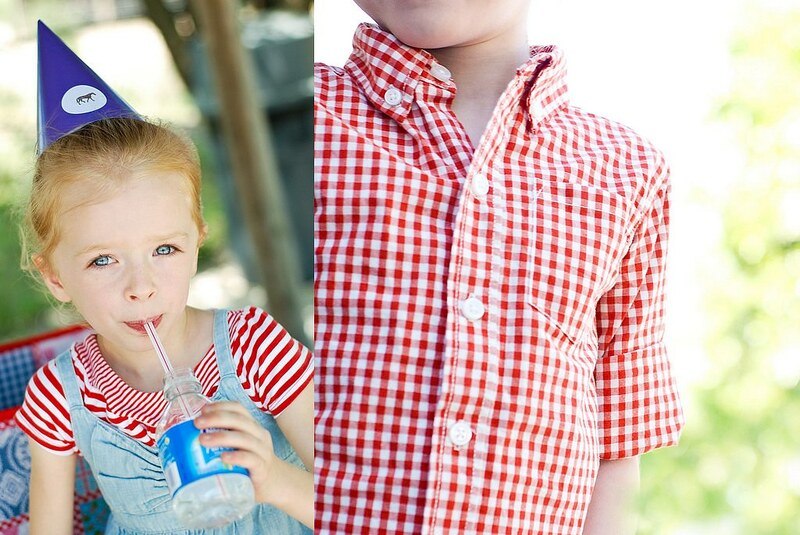 Exemplified perfectly bellow is the red gingham shirt my daughter is wearing. It is not only a boys shirt, but also a size 18-24 months. She is 5 and has been thrilled to receive many compliments while wearing it. 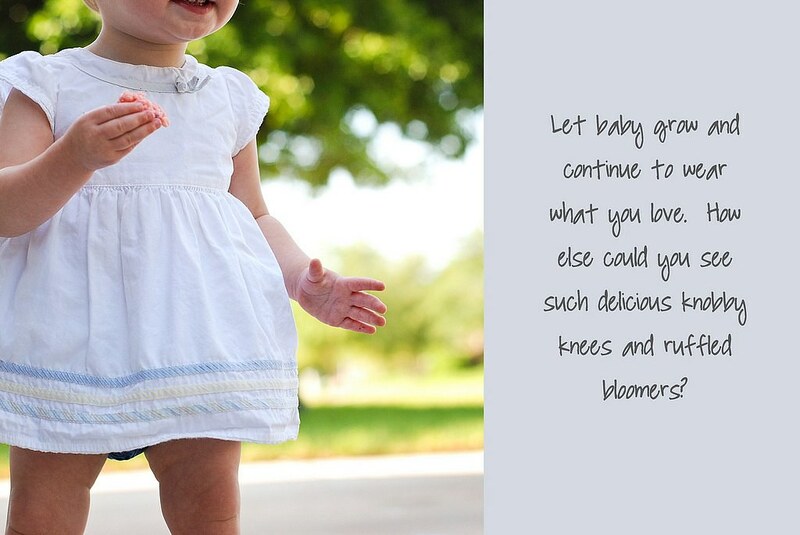 Stretch the life of your child's clothes by holding onto them for a while. Forget about the size printed on the tag. Long sleeved cardigans become three quartered sleeved and dresses become tunics. I think that parents frequently put away clothes that are just beginning to fit well and look tailored to the child's body. 3. Dress babies like babies. Put your tiny tots in something soft and comfortable. When my oldest was just a few months old I loved wrestling her into jeans. The poor thing had a Levis brand under her armpit all day. Dress babies in things that not only encourage people to cuddle with them but make it possible for them to take long comfortable naps when it suits their fancy. And of course, sensible shoes are a must! 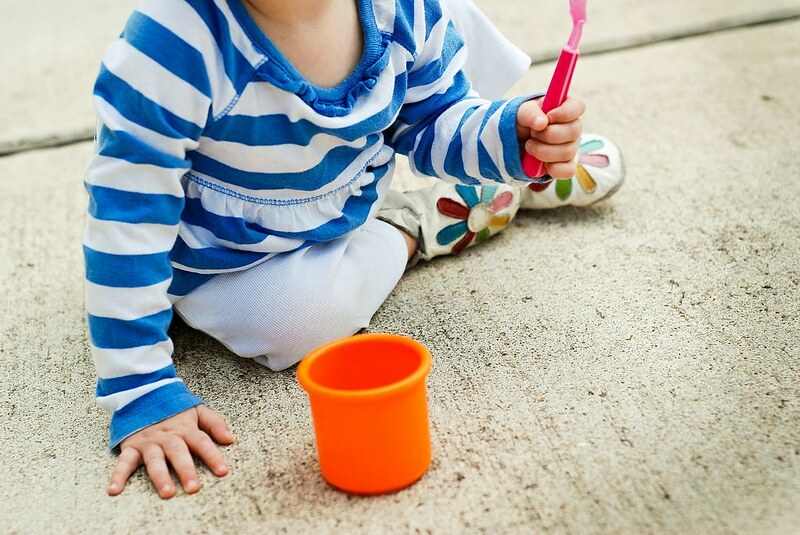 The soft soled shoes facilitate crawling and walking while keeping their feet protected and warm. Now I must ask you. What are your tips for dressing little chickens? Do you have an opinion about what they wear? And to be completely honest with you, I do love a day when they come downstairs perfectly, horribly dressed themselves. I can attest that her girls really look this cute ALL THE TIME. Brilliant. Although I am a little disappointed not to see a post on how YOU dress yourself, Ralphie. THAT is something I need to know more about. great post. thanks for sharing awesome guests with us:) i'm heading over to Ralphie's site now! Love the advice about disregarding the tags -- I've never really thought about it but I always try to dress Theodore in "age-appropriate" sizes, keeping him right in line with where he should be, but it's silly!